Farther down the sidewalk toward the Northwest Spiral Staircase is the “Sherlock Holmes” marker. 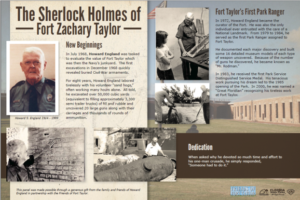 No, not the Sherlock Holmes of Baker Street fame, but the man hailed as the “Sherlock Holmes of Fort Zachary Taylor” by Marita Adair Hildalgo, a magazine writer in 1984. Her article chronicled Howard England’s work as the original explorer of the ruins of Fort Taylor, the first curator of the National Landmark site, and the first permanent Park Ranger at the Fort. He worked for 16 and a half years to bring the Fort to public prominence and then into the Florida Park System. Beginning in 1968, first as an unpaid volunteer, then as a State of Florida hourly employee, and finally as an official Park Ranger, he dedicated his life to the Fort. Along with his volunteers, that he called “sand hogs” for all the underground work they did, he uncovered weapons and ammunition buried in 1898 in the South Curtain of the Fort.